Defending champion Caroline Wozniacki was knocked out of the Australian Open as five-time Grand Slam winner Maria Sharapova provided a reminder of her ability with a three-set win. Russia’s Sharapova, seeded 30th, hit 37 winners in a 6-4 4-6 6-3 victory to reach the fourth round. Wozniacki, 28, led 4-1 in the first set, only to see Sharapova battle back. 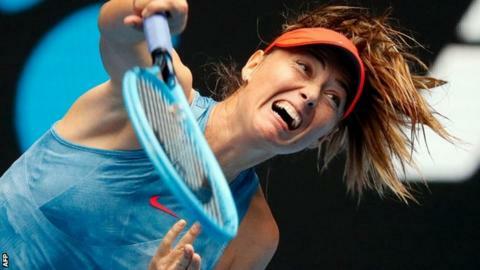 The third seed broke in the final game of the second to level, but Sharapova edged a tight third in Melbourne. The 2008 Australian Open champion, 31, took her second match point to win in two hours and 24 minutes and set up a fourth-round meeting with Australia’s Ashleigh Barty on Sunday. “I haven’t played many matches in the last year, especially against top players and these are the ones I train for, so it’s really rewarding to win,” said Sharapova, who served a 15-month ban for failing a drugs test. Danish world number three Wozniacki, defending the ranking points won in Melbourne last year, is set to slide down the standings as a result of the defeat. She was competing at a Grand Slam as the defending champion for the first time, but says the experience did not put on added pressure. “I did not find it hard all all. I find it kind of pleasurable,” she said. “In tennis, you’re one on one, you battle and you do your best. One day you win, some days you lose. Sharapova has been unable to climb back into the upper echelons of the game since returning from a doping ban in April 2017, making just one Grand Slam quarter-final at last year’s French Open. But against Wozniacki she proved she still has the talent – and, most importantly, desire – to cause problems for the world’s best. It was not Sharapova’s biggest win in terms of ranking since returning, having also beaten Simona Halep – who was then second in the world – at the 2017 US Open. “These are the types of match-ups that I haven’t really had where I could really challenge myself,” Sharapova said. “Whether it was a bad result or an easy two-set loss, to be in the grind of things and to have to figure out a way to be on top is what I missed. “Halep was where I was challenged like that and maybe one or two other matches. While she obviously impressed with her quality of play, her sheer will-to-win also stood out. Against one of the game’s fittest and most relentless players, the Russian won 17 of 23 rallies which lasted nine shots or more. That included a pivotal moment at 4-4 in the first set where she switched hands in a 23-shot rally to stay in the opening point and went on to win it. In turn, she went on to hold and broke in the next game on her way to the opening set. Sharapova was constantly screaming in celebration after seeing winners go in and an intense fist-pump at her box moments after clinching victory illustrated how much it meant. “I haven’t played many matches in the last year against top players so it was really rewarding to win that last set,” she said. Defeat is another blow for Wozniacki, who announced in October she has been diagnosed with rheumatoid arthritis. The former world number one came into the first Grand Slam of the year with little hype, perhaps because she has not gone past the last 16 at a major since winning in Melbourne and lost to Canadian teenager Bianca Andreescu in Auckland earlier this month. She found encouragement by easing past Belgium’s Alison van Uytvanck and Sweden’s Johanna Larsson – both ranked outside the top 50 – in the opening two rounds here. But, against Sharapova, she was outfought. Wozniacki was among one of the most vocal critics of Sharapova following her doping ban, leading to Sharapova’s agent Max Eisenbud dismissing the Dane as a “journeyman”. Yet there was a civilised handshake at the net as Wozniacki congratulated Sharapova on her performance. “Our terms are the same as they have always been,” the Dane said. “I think she doesn’t really talk to anybody and has her team and has her own thing.